As a fan of Slayer, the last few years have been anything but bright. The tragic loss of Jeff Hanneman in 2013 saddened many who saw him as the reliable bedrock on which Slayer's dark church was built, and few fans liked the firing of Dave Lombardo, apparently over money issues. Exodus' Gary Holt and the returning Paul Bostaph may be decent replacements but they can never truly be Slayer in the way that the classic four members could be. 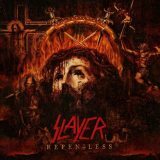 So it's hard to approach Repentless with a great deal of enthusiasm, especially following recent interviews with Araya where he sounds every one of his fifty-four years and hints essentially that Slayer only release new albums to tour on. It's sad, partly because Araya has always seemed a very likeable, down to earth, family-oriented man, and his weariness is infectious. Are we any more eager to hear new Slayer than the band seems to be in making it, or is it just business all around? Metal bands that fail, inevitably, to live up to past classics get a lot of eye-rolls and 'man, these guys should just retire'. Fans will probably listen to this once or twice then ignore it in favour of Seasons in the Abyss or whatever your personal favourite pick of early Slayer is; hell, I praised World Painted Blood more than the average in 2009 but I think I've listened to it maybe once in the five or six years since compared to the many listens Reign in Blood and South of Heaven have received. Not that there's anything really wrong with that, but listening to Repentless does make me wonder if any new metalheads are going to discover the genre with this in a way that others did with past albums, and if they're going to love it as much. It's a perfectly solid album for Slayer in 2015, on a par with World Painted Blood. There are fast thrashy songs, there are slower, more atmospheric groovy numbers. Gary Holt fits in well (as he should, having been a thrash guitarist for over thirty years) but despite some terrific solos his addition doesn't lead to any particularly memorable songs, and as usual you'll be able to recognise past riffs and song ideas repeated here. But this is a Slayer album, and the music is still heavy and impactful enough to make it enjoyable. Araya sounds bored at places, but overall is the driving force behind the music still, rabidly spitting out lyrics on the title track and stealing back a bit of the viciousness that the blurred-sounding guitars are robbed of by the production. Even so, you can count Take Control, Cast the First Stone, and Vices as decent enough thrashers that will get plenty of pits going live, even with the awful lyrics (“A little violence is the ultimate drug/Let's get high!”). And while there's sloppy writing all over the place, such as the Cultlike When the Stillness Comes' dual intros, and a little too much groove metal still in the mix (When the Stillness Comes, again, as well as closer Pride in Prejudice), the likes of Chasing Death and Implode soon come along to wash away the taste. Piano Wire, the last Hanneman contribution, is solid enough as an echo of Mandatory Suicide, Atrocity Vendor has a nicely old-school opening and rattles along well enough, as does You Against You. Maybe the problem is just that we still see thrash as a young, hungry genre, which it hasn't been in a long time. It's been three decades since the genre's 80s heyday and its elder statesmen are fast approaching retirement age. Fans, too, see it as something to reminisce over, reliving the past through the classic albums and going to enjoy live when it comes to town, if not paying as much attention to new releases. Business as usual for Slayer, then.